Institutional funds have rotated into blue chip stocks over the past weeks, enabling the Dow Jones Industrials to outperform the other market indexes. Are traders and investors suddenly in love with old school, large cap companies like Coca Cola more than the tech darlings? No, this is merely sector rotation — a healthy and normal event that occurs when hedge funds and institutional traders move around massive sums of money. 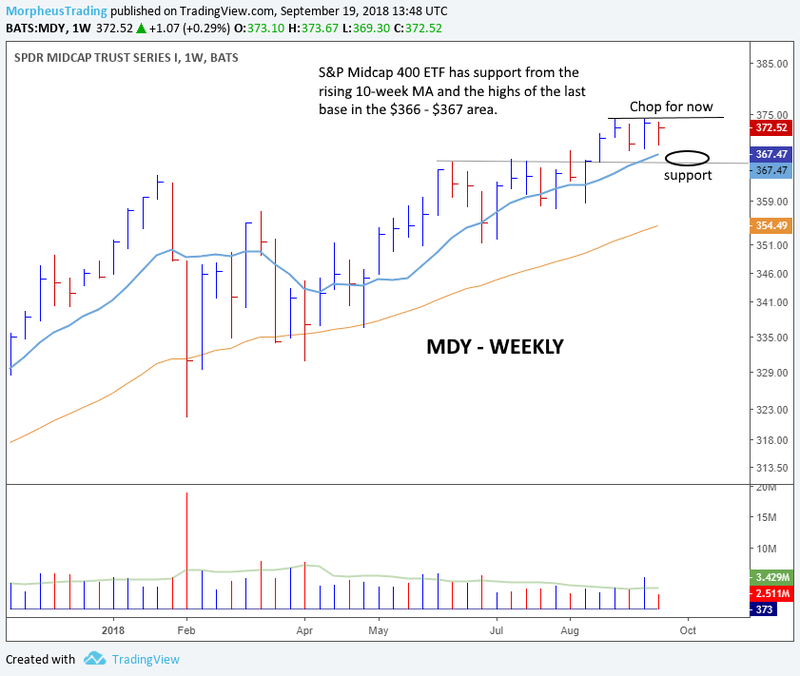 As such, we expect money to eventually flow back into NASDAQ 100 ($QQQ), S&P Midcap 400 ($MDY), and Russell 2000 Small-Caps ($IWM) — as long as their weekly charts stay in pretty good shape. CONTINUE READING to find out which indexes could be the next to move higher, based on key support and resistance levels to watch. $SPY was previously lagging behind NASDAQ 100 ($QQQ), but finally broke out to new high about a month ago. Since then, the benchmark index ETF has been chopping around in a fairly tight consolidation pattern. This sideways price action is bullish because it enabled the 10-week moving average (MA) to rise and give support at the range lows of the consolidation. 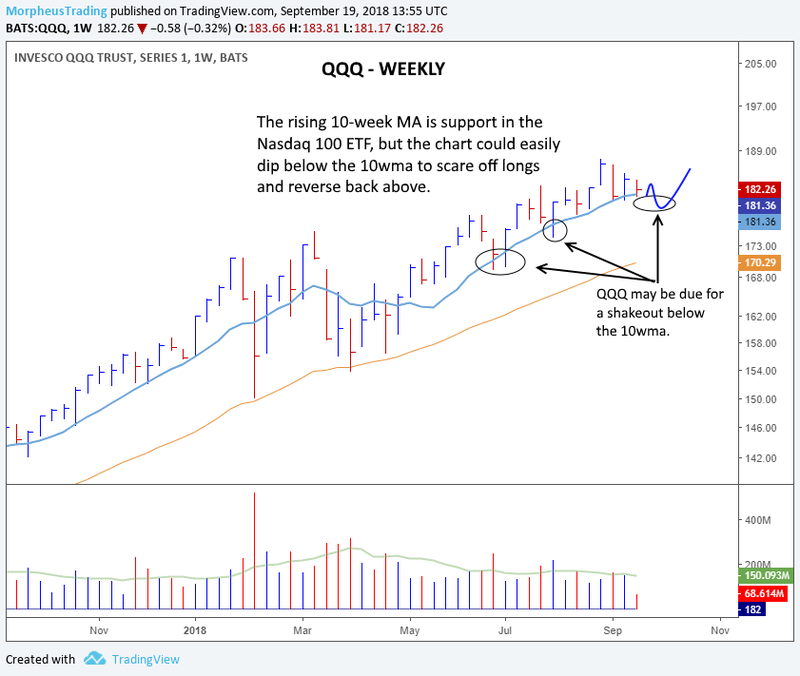 $QQQ has been in chop mode the past three weeks, while holding above key support of its 10-week MA. 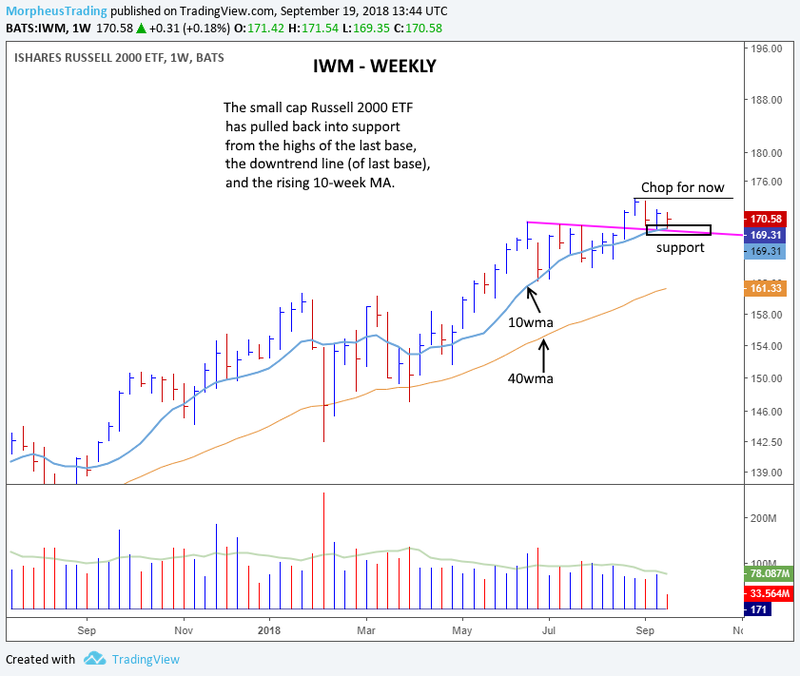 $IWM is forming a “base on base” chart pattern, which is a bullish sign. A base on base pattern occurs when a breakout fails to extend much beyond the highs of the previous base, then chops around for several weeks on top of that proceeding base. Despite the choppy price action, $IWM still shows major support of both its 10-week MA and downtrend line from the previous high. A prior level of resistance becomes the new level of support, AFTER that resistance is broken. That’s why the previous downtrend line from the June high (pink line) is now acting as key support for $IWM. Similar to $IWM, $MDY is now about four weeks into a base on base pattern. 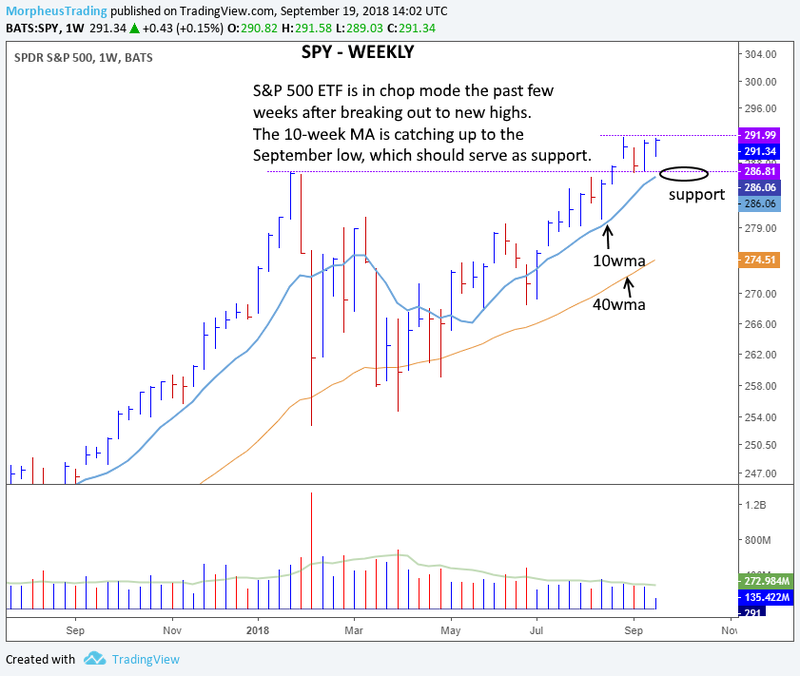 The 10-week MA is providing support, AND has risen above the highs of the previous base (bullish sign). Based on the weekly charts above, the main stock market indexes remain overall healthy. $DIA and $SPY broke out to new highs ahead of the rest of broad market and are consolidating near their new highs. $QQQ, $MDY, and $IWM have been showing relative weakness, but each index has substantial support below. Regardless of whether you trade individual stocks or ETFs, you will benefit by marking down the key support and resistance levels shown on the charts above. This “big picture” analysis can help keep you focused on taking advantage of market momentum at the right time and correct direction. I recommend setting price alerts on these index ETFs to instantly alert you to a breakout to new highs, or a breakdown below key support levels. As always, drop us a comment below to share your thoughts on this article. 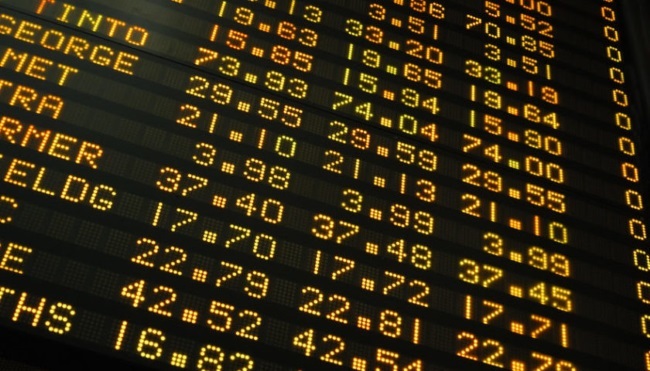 How Will Current Weakness In Small-Cap Stocks Affect The Market Rally?